Celebrating the Back Door Bottega 10th Anniversary. The piece is characterized by a special Vibram sole and incorporates some of the most iconic aspects of Nike Air Jordan, paying homage to the iconic athlete which a special exhibition was held at Back Door Bottega. A collaboration to celebrate the 10th anniversary of Back Door Bottega. 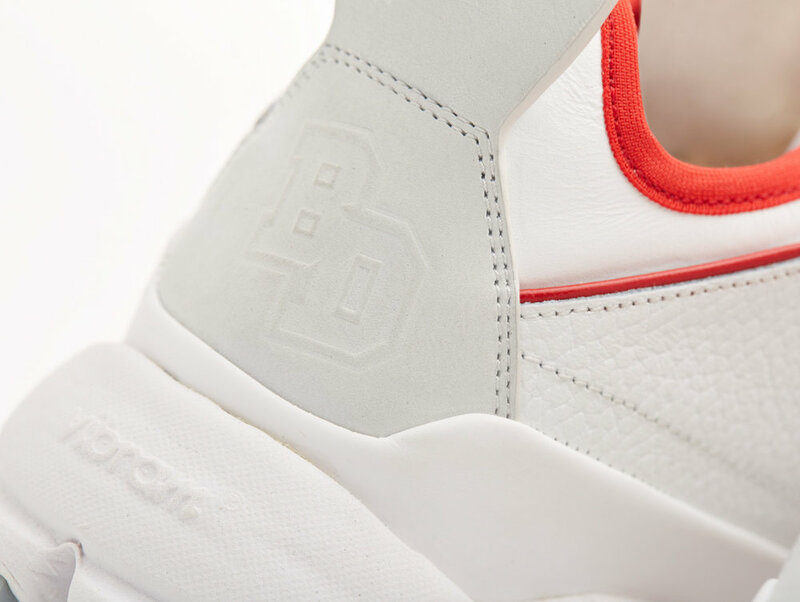 The style of the greatest player of all time merged with the savvy touch of the best Italian craftsmanship are the essential elements of “The Secret” sneaker: a groundbreaking design created to celebrate the shared devotion to the Game that connects Search N Design and Back Door Bottega. Characterized by a distinctive Vibram sole, “The Secret” sneaker incorporates some of the most iconic intuitions of Nike Air Jordan, paying homage to the greatest player of all time to whom Back Door Bottega. has dedicated a special exhibition. White and red, the 'The Secret' sneaker remembers the Air Jordan 2 OG "Varsity Red," but presented in smooth, hammered and partly perforated Italian tanned leather, with elastic neoprene sock and an EVA and Rubber Vibram sole. SEARCH N DESIGN X BACK DOOR BOTTEGA - “THE SECRET"
• "The Secret" fits true to size. • Nike Air Max Example: if you wear a men's 9 US or men's 9.5 US, you should go for a 42 EU. • Main: Plain Italian tanned Chrome premium Leather. • Details: Elk Grain Embossed Italian Tanned Chrome Leather. • Details: Perforated Plain Italian Tanned Chrome Leather. • Back Details: Hand Painted Doubled Plain Italian Tanned Chrome Leather. • Back: Padded Elastic Lycra Sock. • Internal: Breathable Polyester Mesh. • Moulded Preformed Eva paired with a Vulcanized Rubber Bottom. • Italian Tanned Cow Leather over Double Density PU Foam. • Traditional Lasted over a Texon Board. "The Secret" fits true to size. Nike Air Max Example: if you wear a men's 9 US or men's 9.5 US, you should go for a 42 EU. Once the shipment of your order is arranged, you will get a mail including the tracking link. If you don’t have any tracking number for your order, please check your spam folder or just get in touch with us. In order to open a return request, please contat us at account@searchndesign.com.